By Jake Rocheleau in E-Commerce. Updated on November 10, 2017 . Transaction is no longer limited to real world today. Witnessing the Internet reconnaissance happening in every modern country, most companies especially big brands have setup their own e-commerce sites with several payment options offered for secure online shopping and transaction. However, what we heard almost everyday is transaction security issue like phishing scam happening all around the world. If you’re like the many consumers of digital goods you will surely be processing transactions online every so often. We know the companies are doing their job very hard to tighten the security, but as a consumer you must be well-prepared to tackle any possible transaction issue or trap. Below I’ve illustrated a handful of tips you may apply in your day-to-day life, stick to some of these best practices for smarter online purchases, all to keep your money secure! Credit cards have made all of our lives easier. It’s now simpler than ever to purchase new device, cloth, furniture, or anything online at the drop of a hat. However online phishing scams are still very popular and can be credited for thousands of identify theft cases each year. Your experience online will move a lot safer by purchasing your goods through a 3rd party system. These are external websites which connect into your bank account and perform transactions without sharing any security data to another website. The process usually requires a redirect to the service website where you’ll enter a user ID and password. If successful you’ll be sent back to your order page with a small payment token to approve your order. PayPal is generally the most trusted purchasing system on the Internet. They offer many possible solutions for connecting your credit card or bank account into a single PayPal account. You will need to wait a few days after signing up so the system may process your new information. If you connect a savings or checking account PayPal will deposit a few cents as a test measure for transaction. As a general rule, always be using your best judgement before purchasing something online. The Internet is a very big place and it’s easy to get lost. If you have the time check Google for the names of each e-commerce store you shop at. Most of the time you’ll find results with folks reviewing and discussing the legitimacy of each website. You’ll also notice right away if the top links mention scammer or fraud. It’s difficult to keep your information hidden these days. And unfortunately it’s almost impossible if you’re planning to purchase goods online. But consider if you’re purchasing items through a 3rd party merchant account then you’re over a secure line. Check your browser URL bar for a padlock or similar icon. Also the HTTP:// before the web address should have changed to read HTTPS://. This extra S applies a secure layer to the data transfer so nobody can snoop into your packets. While looking at the address bar also double-check that the website you’re on is correct. Old phishing scandals would work as people purchased through similar-looking URLs and spread the links around online. It is still common to see something like paypal.kwebsite.com with a landing page designed to mimic PayPal, all in the hopes of capturing unsuspecting visitors’ account details. Talking about safe browser, Google Chrome has been listed as one of the most secure browsers. Mozilla Firefox also has a lot of security features built-in for SSL and checkout pages. These two alternatives are much better than the OS defaults (Internet Explorer and Safari). Also if you’re not a fan of either browser I recommend Opera for the real techies. If you’ve never tried before it’s a very quick and constructive browser, and just as beefed with security. The most obvious reason why you may wish to signup for PayPal is how widely the network is accepted. Most e-commerce websites you find online will accept PayPal payments. The majority of products I’ve purchased online have been through PayPal and fund transfer is safer than ever before. When you register for a new PayPal account it is required that you provide an e-mail address. This will be used for all future PayPal payments and money requests. 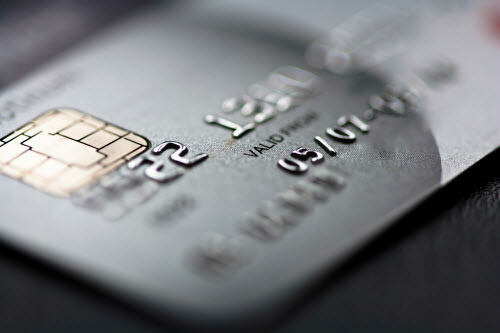 You’ll be given the option each time whether to use your credit card or bank account(s). Unlike other lesser known platforms PayPal additionally allows you to store 5 more e-mail addresses. This means you’ll be able to send and receive payments online while keeping your main e-mail address hidden. If you plan on purchasing from a few websites but wish to keep your inbox free then it may be wise to add a few addresses into your account. This feature probably gives you some options for keeping your business and personal life separate on multiple levels. Only the coolest tech companies have moved their systems into the mobile cloud. It is here where users can interact with web servers hundreds miles away while out and about. 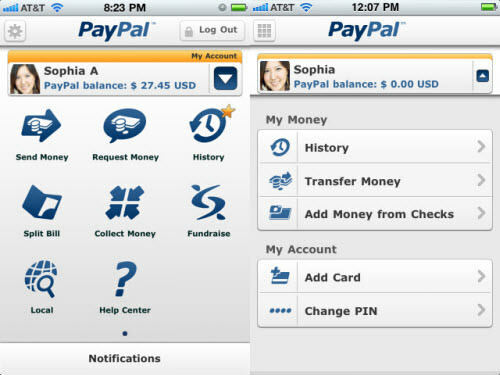 The PayPal iPhone app is one such solution which securely manages your account details and current balance. If you’re a bit taken away from the smartphone realm it’s still possible to request data from PayPal. Their mobile system supports SMS text messaging and can return notifications to your phone. Check their messaging commands for a bit more detail in the subject. If you text their number 729725 (PAYPAL) with any of the outlined keywords you’ll be given a response with detailed account information. Through this method you may pull up your current balance, send and request money, or cancel a current payment. Although this system does work, to be honest it is nowhere near as secure as their mobile application. Once you login to the PayPal app and begin to move cash around you’ll notice very quickly how secure it is. Each transaction is confirmed with a PIN or password. This protects you against possible snoopers if you have your phone stolen or lost. You may also store personal contacts in the PayPal app for quicker invoicing on-the-go. And the best feature? It’s completely free to download! If you do not trust PayPal with your account details then Google may be another alternative. Today it seems Google is running more of our digital lives in conjunction with our physical reality, thus it’s not uncommon to find users with Google accounts storing email, documents, messages, and now bank account information. Google Checkout is just as secure as any other Google app, which has proven to be quite a bit. There have been very few, if any, major hacks into the Google servers where data was stolen or lost. This isn’t to say it’s an impossibility, but surely the numbers are in their favor. Google has also a much more small and tightly-controlled team of developers who focus on scalability and proper security measures. If you’re already a Google user I highly recommend getting into Checkout. PayPal is certainly an option and much more mainstream for businesses and individuals. I am however seeing the Google Checkout system accepted in many e-commerce stores around the web. Unfortunately its availability is currently limited to U.S. and U.K. merchants at the time of writing, but you can check out the Merchant Help page for more related detail. Most Internet users are also some form of digital guru. Be it web developer, digital artist, designer, mobile engineer, blog writer or Internet marketer we all share very similar needs. A Google Checkout account will automatically tie into your other Google Accounts, meaning you may share payments equally among apps. This system works some real magic for AdWords users who need to keep advertising links running. Google can tie into your attached bank account or credit card and pull new funds for your ad campaigns. You may set up vouchers or auto-payment methods as well. On a similar manner AdSense publishers can transfer their earnings directly through Google Checkout. It used to be required where AdSense would send each publisher a check at the end of each month. This is still very common and the majority of users are following the generalized system. But Google runs such an intricate company and supports creative methods of publishing where advertisers may work with their AdSense earnings dynamically, or transfer directly to their account via Checkout. Ultimately Google Checkout is just secure. It just works, and there have been very few major issues as of yet. The system first launched in June of 2006 and now 5 years later, it has showed some amazing advancement. Now you’ll find Google Checkout buttons plastered all along Amazon and even some infamous Yahoo merchant accounts! We are all very skeptical of the system and wish to keep our personal information secretive. There is no reason to put so much information into the Internet unless you have a good reason for doing so. If you feel uncomfortable sharing your living address to a company which doesn’t need any address for your purchase, you may consider making up some false information. Short of purchasing physical objects which require a mailing address, your house number is only useful for mailing leaflets and coupons. Also if you are receiving paper bill payments via the mail you’ll obviously be required to share openly and honestly. But there are companies offering strictly digital goods which you can pay via PayPal or similar systems, with no further information needed. In truth there isn’t very much to be worried regarding personal account information. Even the most simple e-commerce systems are built with tremendous security and database logs to keep your information hidden. The odds of becoming a victim to hacking of information is very slim. But the risk is around, so use your best judgement when purchasing from a site, especially a new website. Now into 2011 we have seen the creation of some fantastic mobile apps. 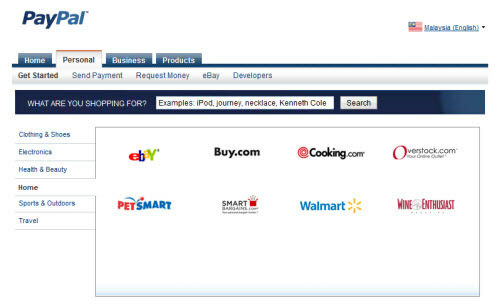 Along with the recent builds for popular companies such as PayPal and Amazon there are many other options to choose from. 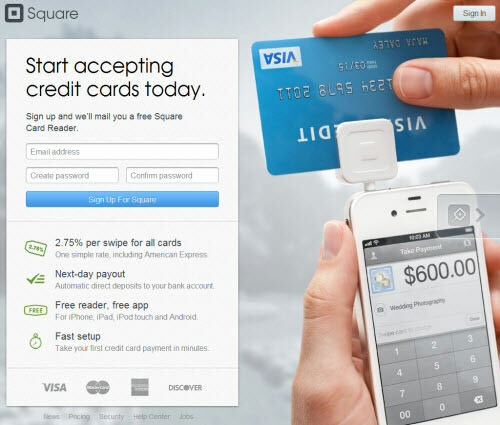 My personal favorite is Square, which was founded by Jack Dorsey (co-founder of Twitter) in San Francisco. It’s been online since early 2009 and has provided one intense mobile experience. Their application comes with a small card reader which connects into your headphone jack. From here you may swipe cards and accept payments on the go through your Square account. Pretty amazing on what this technology can do! The small startup has received over $25 million in funding and has broken through the tough market with some bright new ideas. Although they’ve been running for a full 2 years Square is still a very new company. It’s possible they may capitalize on the newborn mobile market and corner a very large segment of the digital economy. What could their technology do with the current cash register? 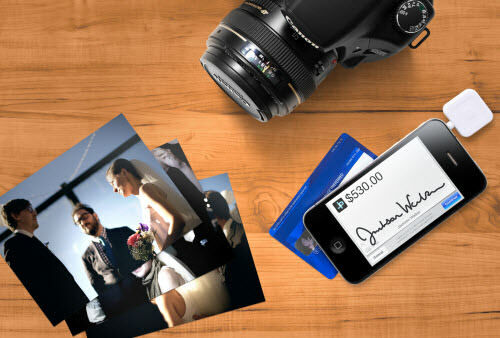 If you can record all purchases directly from an iPhone or iPad this completely revolutionizes the way we do business. I’m certainly not expecting grocery stores to start adopting this software tomorrow. But mobile apps are on the rise in popularity. And as the global economy teeters on the edge tech enthusiasts are looking for new ways to capitalize on old market. Purchasing online has become a simple process which requires just a few steps. It’s so simple to offer a PayPal payment these days, probably within minutes. This speed is increasing tenfold as the year progresses. So where can we expect technology to be in a few years? The ideal society would be completely mobile on their funds. No needs for paper cash of any kind and all transactions are recorded directly from mobile devices. Imagine if we could directly pull out and receive new funds into our bank account instantly by contacting a friend or co-worker. The checkout process in stores would become much less of a hassle. You’d also be able to update funds and process payments while on-the-go! 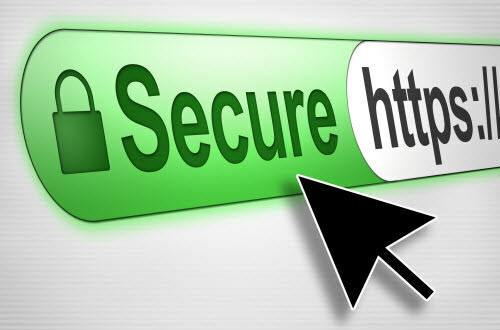 SSL is required in most web apps performing secure data transfer, especially with money. It’s the encryption style used for HTTP web browsers to access any secure web account. Hackers are frequently trying to build software to reroute ports and enter backdoors. But modern programmers are just too smart and they’re building some amazing software to power the future. Security for both web users and mobile apps will increase quite a bit as new algorithms and complex data structures enter mainstream. Currently it’s hard to judge which technology will come out on top. Clearly the mobile industry is booming and hasn’t shown any signs of slowing. Android, iOS, and BlackBerry OS have been reaching record sales in the past few years. And with more app developers than ever before it’s possible we’ll see some amazing feats within our lifetime. I’m personally very excited and hope to be working with some of the forerunners in this paradigm shift. This guide should gave you an introduction into purchasing goods safely online. The transfer of money digitally has become commonplace in today’s futuristic society. And our technocracy is quickly advancing into a better tomorrow. Again, use your best judgement when connecting payments and offering personal information to websites. If you can, keep a bookmark list of trusted vendors who you’ve purchased off before as a reference guide. Also don’t be shy asking around online for reviews of different corporations as users are often happy to assist. If you have tips for purchasing goods online share them with us in the discussion area below, thanks!